On Key West, Gas Golf Carts are a real hit with visitors who want to zip around the island the fun way. 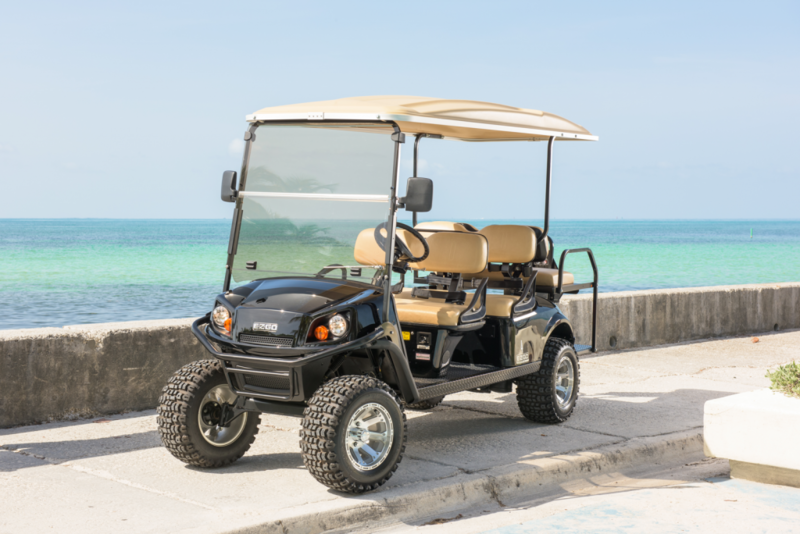 Fast, stable, comfortable, and well-adapted to the island’s tight spaces, a Key West gas golf cart rental is your perfect vacation transportation solution. Like the ubiquitous Key West scooter, a gas golf cart is scaled to fit on an island. Also like a scooter, a gas golf cart can weave through traffic, handle narrow roadways with ease, park in the tightest places, and run all day on a couple bucks worth of gas. Unlike a scooter, a gas golf cart can do all this while carrying up to 6 people and maybe a cooler, picnic basket, or bunch of shopping bags. Today’s gas golf carts have left the course behind to become legitimate vehicles that can run legally on Key West roads. Tough, stable, powered by 401 cc, 4-cycle, low-emission 13-horsepower engines and sitting on 23-inch all terrain tires, these machines are more than up to handling all your island transportation needs. A gas golf cart is safe enough for the family and comfortable enough for those who may be a little beyond the scooter stage of life. Padded seating, leaf spring/hydraulic shock suspension, plenty of leg room, wide-open views, cup holders, and shade from the sun are all standard features. These carts are easy to drive. A fully automatic transmission, rack and pinion steering, and drum brakes make for responsive handling. The quiet, economical engine is worry free and ready with sure power on demand. A Key West gas golf cart rental will pay for itself in just plain fun. The breezy open-air ride surrounds you with the sights, sounds, and fragrances of paradise and the cart’s golfing roots show in the ease with which all passengers can step on and off in seconds to see the sights. Even though it rolls on 4 wheels and has a windshield, a gas golf cart projects a sense of freedom and fun times that a car just can’t match. See for yourself why gas golf carts rule island transport with a Key West gas golf cart rental. Free pickup to one of our 2 easy locations will get you on the road in minutes, and complementary gas and oil refills will keep you rolling in a gas golf cart from Pirate Scooter Rentals Key West. This entry was posted in Key West Golf Carts. Bookmark the permalink.